Height is a signal of dominance to a multiple cat household. The cat who sits atop the highest spot is usually the one who is in control, the king or queen of the household. Just remember, our lovable furry friends used to live in the wild and many of their traits come from nature. By climbing up to high place, cats are better able to observe what goes on around them and in some instances use that vantage point as a place of refuge. Heat rises during the day time hours. Usually the highest spot in the home is the warmest and your cat wants to be in the warm area. Being away from the the other cats below is a way of calming for your cats. Maybe they have had enough interaction the other cats and just need a break. Designer cat furniture may be an answer in helping you keep your cat in high places, enstead on top of the kitchen cabinets. 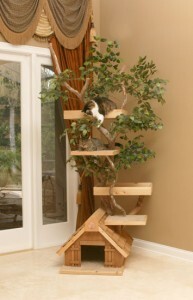 I think that is the coolest cat tree I have ever seen!